Super Shine Aluminum Polish: Restores brilliance to dull uncoated aluminum wheels, fuel tanks, trailers, diamond plate, and trim. Can be applied by hand or power buffed. Black residue wipes off easily and washes off hand with soap and water. Provides a long lasting brilliant shine with superior resistance to dulling. 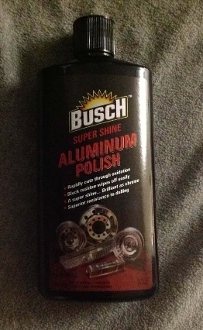 To reduce buffing effort, use Busch Aluminum Wash before polishing with Super Shine, and to prolong the shine, follow Super Shine with Busch Aluminum Wax and Sealant.Super Shine is also available in kit form.